"Annual British Columbia Fish Quiz"
Pacific Mackerel caught off the west coast of Vancouver Island . 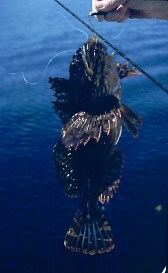 Cabezon are often caught while drift fishing close to the bottom. 11. There is a sixth Pacific salmon species, the masu, that lives on the Asian side of the Pacific. What is the common name for this salmon? Mackerel have recently been accused of decimating many migrating schools of young salmon along the B.C. coast. It has been suggested that they have moved north as a result of the warming effects of the El Nino current. However, the "Pacific Fishes of Canada, Bulletin 180" states that they are, "Fairly abundant off the west coast of Vancouver Island." They also relate one situation in 1940 when "immature mackerel were fairly abundant in the Strait of Georgia, and later there was stranding in the estuary of the Courtenay River." 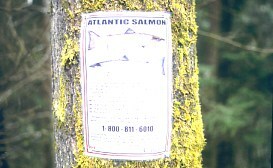 Atlantic Salmon information posters have been displayed on many coastal rivers requesting that anglers notify DFO should they catch an Atlantic Salmon. 12. 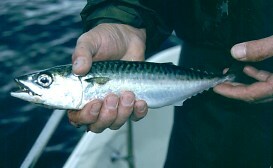 Pacific mackerel have easily identifiable 'tiger' strips on their sides. What length do they reach at maturity? 13. What is the daily catch limit for mackerel? Atlantic salmon numbers in Pacific northwest waters appear to have increased quite dramatically. According to Andy Thomson, Contract Biologist to DFO; they have currently seen more than all previous years combined. The startling news in 1997 was that 66,000 adult Atlantic salmon, each weighing 4 kilos (about 9 pounds) and 35,000 juveniles escaped from one Washington state aquafarm net pen site into northern Puget Sound waters on July 2, 1996. In 1997 Atlantic salmon were found in 28 rivers in all areas of Vancouver Island. Anyone who catches an Atlantic salmon is asked to call Andy toll free at 1-800-811-6010 . 15. What physical features distinguish Atlantic salmon from Pacific salmon and steelhead? Rockfish have high and poisonous protective dorsal spines. 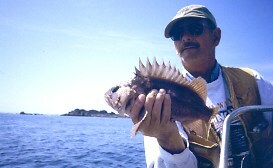 What saltwater anglers often call rockcod are really rockfish. These fish have high poisonous protective spines sticking up from their dorsal fin. However, rockfish are very edible and constitute an important sports and commercial fishery. There are many species and they come in a vast variety of colors. They are primarily a bottom species. Recent advances in age determination have revealed that rockfish as a group are long lived and grow slowly. Several species have been recorded to be older than 70 years and one specimen was estimated to be 136 years old. 16. What is the real name for the bright orange rockfish commonly called the red snapper? 18. & 19. All fish have three basic covers over their body, skin, scales and mucus. Of the latter two, scales can be compared to hair on a mammal's body but the mucus is unique. It has many purposes on a fish's body including acting as a protection from parasites and disease and streamlining the body for quick passage through the water. Fish can loose upwards of 40% of their scales without serious effects. But, they can only loose upwards of how much ( question #18 ) of their mucus-slime covering before they are seriously affected. It is for this reason that gloves should never be used when handling fish that are to be released as the gloves quickly absorb and strip off the mucus from the body. Fish to be released should only be handled with wet hands. As well as acting as a body armour, fish scales can be read in a similar way to reading the rings of a tree trunk. These rings, called circuli are the result of limited growth in the winter or limited growth during an illness or injury. A close grouping of circuli create a dark check or annulus. The front teeth of a river mammal grow just as do fish scales. ( Question #19 ); can you name this industrious mammal? The sharp head spines are obvious on this Staghorn Sculpin. There is a wide variety of Sculpins in the Pacific northwest living in shallow and deep water areas. These are fish commonly referred to as bullheads. The most common is the Pacific Staghorn Sculpin which inhabits the tidal pools and shallow beach areas. Staghorn Sculpins have a sharp bony projection extending from their head which acts as a defense and makes it difficult for a predator to swallow the fish. It is the common target for kids fishing the beach, or, for beach fly fishers who let their flies skim too low on the bottom. 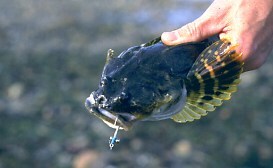 But, can you believe that there is a bullhead common to Pacific waters that will weigh up to thirty pounds! Answers to "Annual British Columbia Fish Quiz"